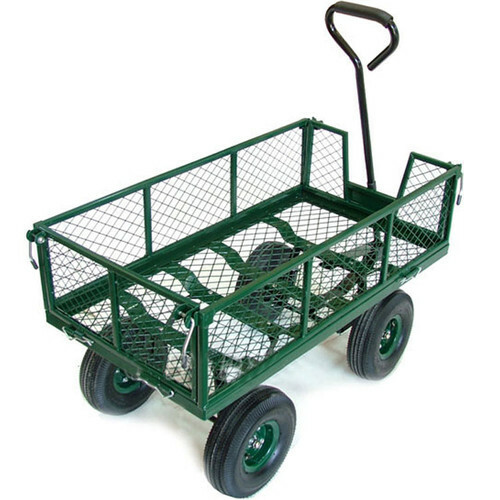 All Things Gardening forum: any great wheel barrow/garden cart suggestions? recommendation. Reading the Amazon reviews... the gorilla sounded promising for a while,,,,, the little mule had some fans. Main need is to move dirt, maybe a rock or two? Any suggestions? Wow, you will be very limited with such a narrow width required, don't expect there will be many choices. Sorry, I have no recommendations! I use the largest cart and wheelbarrow I can handle. Sorry, I have no experience or knowledge about narrow-wheelbase yard and garden implements. I'd say build one. Some of those grocery store shopping carts are fairly narrow. The ones you purchase, not the carts the stores provide for using to shop their stores. I've seen people get them down the narrow aisles of a crowded bus. Some may be too wide, but there are a bunch of different ones. Other things is to fit and secure a box of the right width to one of those collapsible carts you use to move luggage. They have a vary narrow base for you to find or make a box with the dimensions you want to securely attach to. Or make your own platform on wheels and screw a box you made or bought to the platform. Use your imagination for the handles. I have several sizes and brands. I have a duraworx I have had 6 years and it may have faded but works great and I went out to get the name and realized I have a gorilla one I bought at a garage sale for 20 dollars. I am going to see if it dumps as my other doesn't and that hasn't mattered to me as I can roll it over to spill anything including a nice size rock. We just used both to haul 100 lbs of soil and mulch in bags around to my compost pile. We did store the bags in them and they filled with rain water but David drilled one hole in the bottom and they drained easily. You have to put air in the tires every once in a while but that is easy if you get a small portable compressor. I love mine and have had a wheel barrow, Not easy for me to use, a metal wagon they hold up pretty well but took one I had to the dump as sides rusted off and had others so got rid of it after 9 years. I also have found when reading reviews to read them not just stars as some people want things to do stuff they are not made for or expect them to do the work for them. I love both I have and if it doesn't dump it is ok as my other doesn't and I have used it alot. Hope this helps. I'm not much a fan of the all-plastic carts due to durability but that Little Mule certainly does appeal to me. I use a slightly modified furniture dolly to move small trees and medium sized stones. I don't have enough need to justify a tree dolly but the features on that Little Mule might justify looking into them a bit further. The nursery carts cost significantly less but sure don't offer as many features either. Actually my plastic has held up more than the metal ones like this one. http://www.oypla.com/images/ga... I had this one but it didn't hold up but 8 years and rusted apart. Also I had a friend who got a nail in a tire and it was to bad to be fixed and the tire cost too much compared to the price of a new one. My plastic one is a little faded but after 6 years going strong. A little air in the tire and it rolls like new. Also had stored 150 lbs of bags of dirt for a couple months and had to drill a hole as it kept filling with water. I did buy a metal one but have never took it from the box. It is still in my van 5 months later. It was 59 dollars on sale and the box isn't in any shape to return. I will get it out one day. We also use little Tikes wagons left over from DGD's . They work great too. I also have found when reading reviews to read them not just stars as some people want things to do stuff they are not made for or expect them to do the work for them. Hope this helps. Not to edit your post down to nothing but there's a lot of truth in your opinion of "internet reviews". I rarely pay much attention to reviews from box store websites or Amazon. Forums with user interaction are different. I'm not familiar with the poly carts you had luck with but I'd take a gardener's word over the average sales site review any day. I've never purchased a poly cart, just destroyed the few my parent's bought over the years. They just weren't made to be used more than a few times. If the customer was happy they'll just buy another. Big business in junk. I don't have a problem paying $150 for Japanese hand-held shears when I know the box store gimmick shears won't last a season but that's not for everyone. I've got commercial gas and B&D electrics on hand too depending on intended use. On pneumatic tires, there are almost always solids available but you lose the cushioned ride. A healthy dose of a good sealant goes a long way. Until someone manufactures a wheelbarrow/cart with gas-filled shock absorbers and suspension...Still waiting, I'd buy one. It's not always a case of getting what you paid for but honest reviews from real-world users are the way to go. Yep, "Green Slime" works great with garden equipment tires. I used to have to put air into either my garden tractor, cart, or wheelbarrow tires every few weeks (not all, just one of the tires). As those tires got low, I used Green Slime, and I haven't put air in any of them for six months. You can get tire sealant at auto parts stores or Walmart, Lowes etc. There are some more expensive options but the most common is Slime brand (which is green in color). Should be at or under $10. It comes with a small valve stem removal tool that pulls the center "pin" from your tire valve. With the valve open your attach the nozzle of the Slime and squeeze in the recommended amount, re-install the valve stem, air up and you're on your way. The only difference you'll notice is the lack of low/flat tires. I've had good luck with it. 10 minutes start to finish. I use Orgo cart, we got this from Costco a couple of years ago. Can carry 300 lbs. I wanted something then that can pass through our narrow sideyard door and move some bags of soil, some garden tools and it is collapsible too. Thank you guys. That was all good information. I do agree about taking reviews with a grain of salt. I shall be looking into green slime too, I had not heard about that before. You can find it in any big box store. I think I got mine at Wal Mart. I always used a wheelbarrow because it seemed easiest and fastest. Then a guy came in to clean my yard and he had to haul around a lot of bulky but light stuff. He just used a 30+ gallon plastic trash can with beefy handles. That was much lighter than a wheelbarrow, and he could drag it around faster than I could maneuver a wide wheelbarrow around obstacles. 30 gallons is 4 cubic feet, and he could stuff that thing tighter than I can stuff a wheelbarrow, and nothing spilled over. You might find a plastic garbage can useful in narrow spots! I would reinforce the bottom rim with several layers of duct tape or one layer of Gorilla Tape, so that scrapes don't wear away the plastic. But a wheelbarrow is still better for heavy stuff. - one wheel (the weight put inside should be concentrated over the wheel). - not a builder's wheelbarrow (viz wide and relatively shallow, not narrow and deep). (for carrying bulk light things, like leaves, you can have a wooded frame that extends the sides of the wheelbarrow out). Personally, I like plastic, for ease of lifting the wheelbarrow in and out of my van. Find a good quality plastic wheelbarrow (on a metal frame, etc.) outlives many perennials. I can see why you would. It would be unstable on uneven surfaces, and might be difficult to dump stuff out of it, but other than that it looks awfully handy. It's easy to use, easy to dump. I can't handle a wheelbarrow, I'm too short and lack the upper body strength. It invariably tips over because I can't balance it. Most tall people don't realize the difference height (or lack thereof) can make for such tasks.